Gathered throughout his lifetime, the gentleman phantom thief Arsène Lupin assembled a vast collection of dangerous items known as the Lupin Collection. When this collection is stolen by interspace invaders known as the Gangler, two teams set out to retrieve it! The phantom thieves, Kaitou Sentai Lupinranger, who desire to live up to Lupin's name, aim at stealing back the collection from the Gangler. While the police force, Keisatsu Sentai Patranger, who hope to uphold justice, aim to retrieve the collection and take down the Gangler! With two rival teams confronting each other for the same goal, just who will emerge victorious? Whose side are you on?! 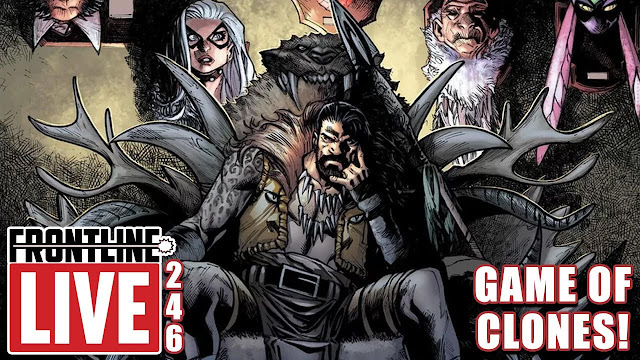 A little precursor to this review; I plan on reviewing the series weekly but had a few set backs so, for this week I am doing a review for episodes one and two, next week I will review episodes three and four and then the following week just review episode five with new episodes being reviewed the week they are released. We open up in a casino where we see a man playing roulette and losing while the fat cat owner is laughing but has a weird glow coming from his stomach that seems to be causing the games to end in the house's favor. Then three Phantom Thieves break through the window and begin shooting up the place and exposing the owner as a monster named Ruretta Gerou (Rouletter) who has a safe in his stomach, and his men are revealed to be his grunts the Porderman. The red thief uses a device that crack's the Rouletter's safe as he retrieves the item he was looking for, a metal box, which he reveals is a piece of the mysterious Lupin Collection. Rouletter fires at them causing an explosion knocking out several windows in the building with flames erupting from it. The G.S.P.O head there with the intention of fulfilling their mission to arrest every Gangler. 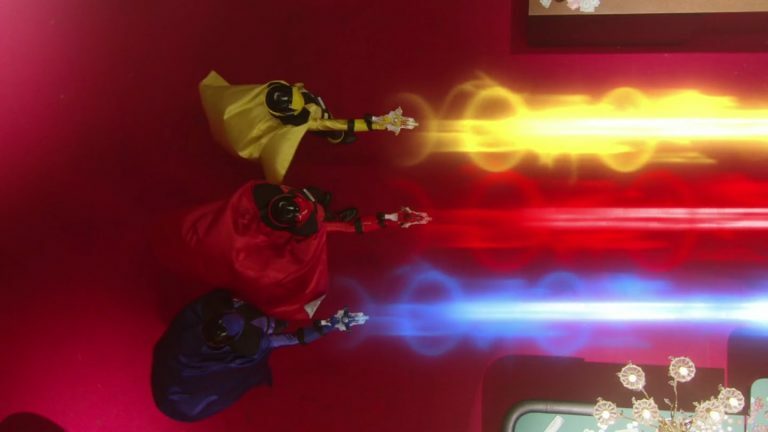 When the flames clear we find the three Phantom Thieves have transformed into the Lupinranger. Kairi Yano/Lupin Red, Touma Yoimachi/Lupin Blue, Umika Hayami/Lupin Yellow. The continue to fight Rouleter and the Porderman. The G.S.P.O. (Global Special Police Organization) Keiichiro Asaka/Patren #1 Red, Sakuya Hikawa/Patren #2 Green,Tsukasa Myojin/Patren #3 Pink arrive and they are shocked to see the Lupinranger there as well, and they recognize them as the Phantom Thieves stealing the Lupin Collection from the Ganglers. 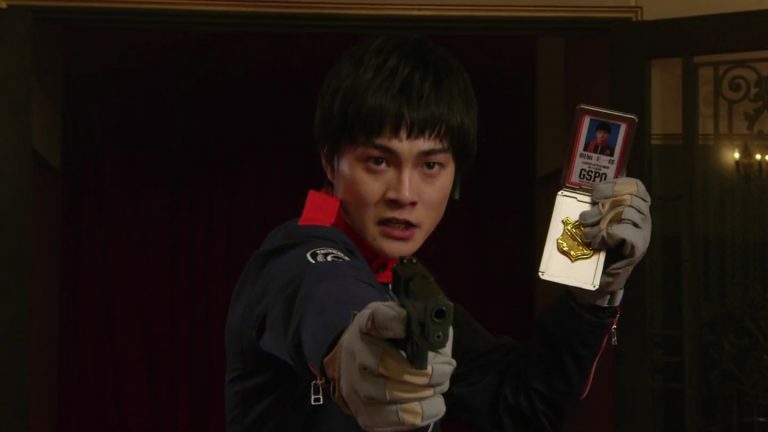 Lupin Red fires his gun and a ship fires out, growing providing an escape for them, evading arrest and leaving behind a card saying "We've taken the treasure", which infuriates Keiichiro G.S.P.O. officer. 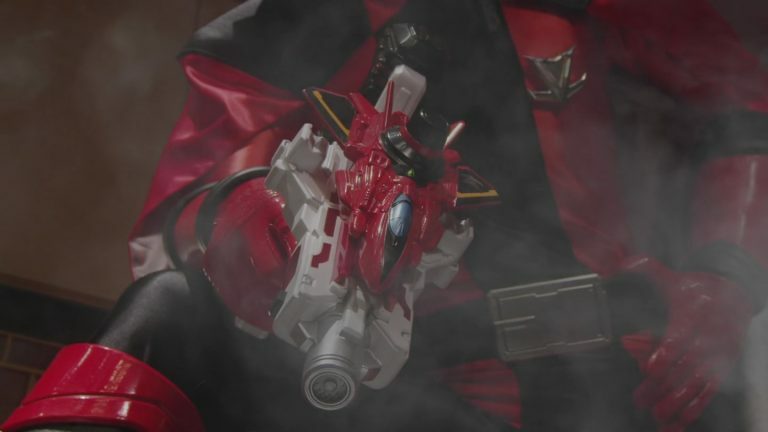 News is covering the Lupinranger latest theft and people are talking which we see pleases Lupin Red in his civilian identity of Kairi Yano. 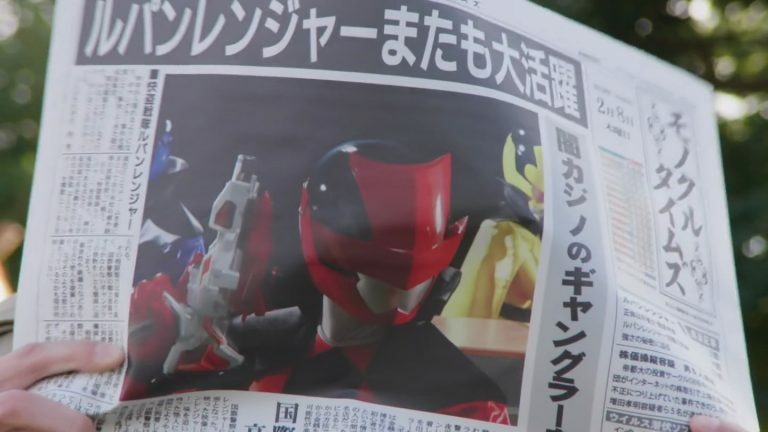 We also see that the Global Police officer Keiichiro Asaka is reading about the heist on a park bench and is frustrated because people are seeing the Lupinrangers as heroes more than thieves and giving them credit for doing damage to the Gangler more so than the G.S.P.O. The two have a brief interaction before a butler named Kogure arrives to offer Kairi a ride. Back at the Lupinranger's French Bistro that the three run as civillains the remaining two Touma and Umika are handling a busy day waiting for Kairi to return with the supplies. Back at G.S.P.O. 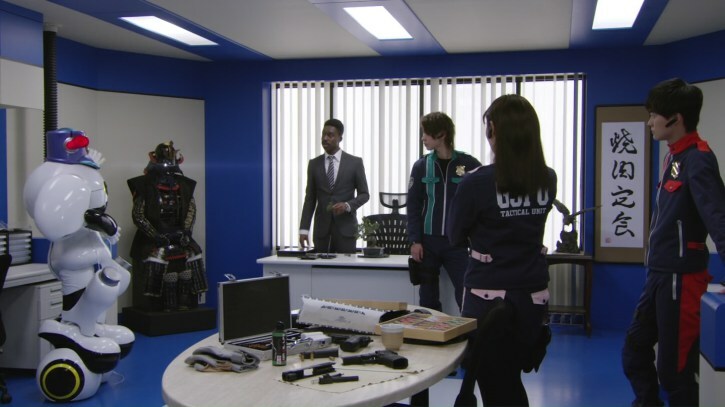 HQ Hikawa and Tsuakasa are doing work with the robot Jim Carter when Commissioner Hilltop arrives with a treat. We find out that Jim Carter is the accountant and office manager overseeing desk work. 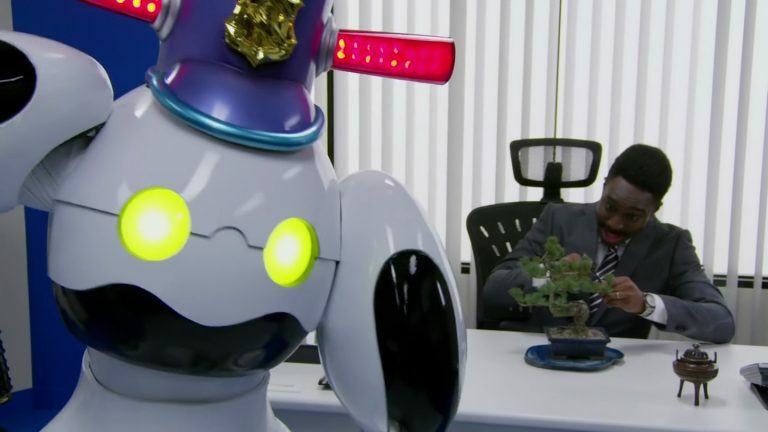 Keiichiro arrives and shows he is frustrated that they did not catch the Lupinrangers when Jim Carter briefs them on what they know of the Lupinrangers so far. In the limo Kairi gives Kogure the item they stole back last night which he places onto a page of a giant book and the image item fills in the silhouette of the item in the book becoming a picture. Kairi then recounts the story of Arsene Lupin, the super infamous phantom thief from 100 years ago who gathered all of these treasures in quiet. Kairi wants to look inside the book to see how many more they have to retrieve when Kogure closes the book and tells him that the artifacts weild strange powers and in the wrong hands could have devastating results. 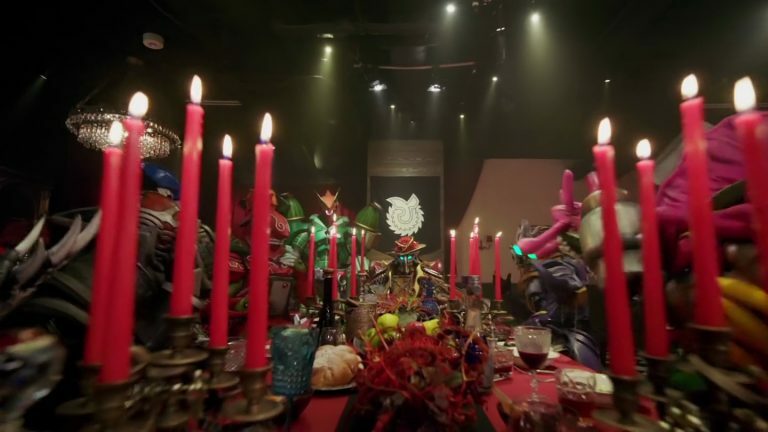 Kogure tells Kairi how grateful he is to the Lupinrangers because his master can not bare to face his great ancestor since the collection was stolen by the Ganglers. Kairi said he doesn't really care about their faces just that Korgure keeps his promise. The Ganglers meet up at their big other dimensional mansion. The Ganglers are all talking, some about Rouletter being taken down. The Gangler leader Dogranio Yabun arrives and we find out it is his 999th birthday, and this is his birthday celebrations. Dogranio gives a speech saying assembled the Ganglers 500 years ago and since then they have done a lot, but now it is time for him to step down and find a successor. He makes the terms simple whoever takes over the human world gets to be the next boss. Back in the limo Kogure gives Kairi an envelope that tells him the next target Garatt Nargo a Gangler who robs jewelry stores then burns them down using one of the Lupin items. Kairi agrees to the job and returns to the Bistro. He walks in and tells everyone they have to leave because they have reservations for a private party right now. 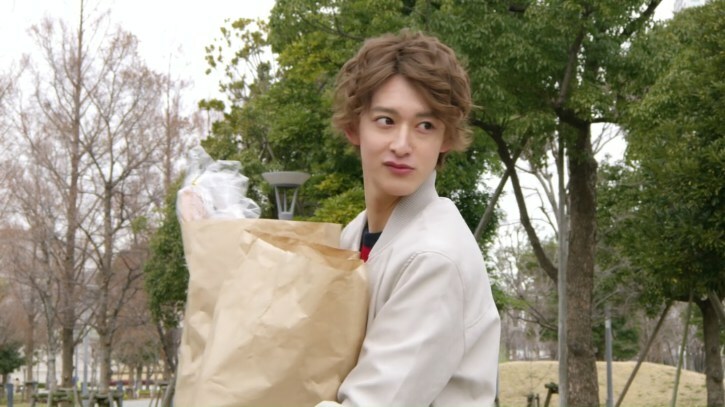 Touma follows suit handing out treat bags as Kairi shoves the patrons out of the door and turns the Open sign to Closed. Umika is puzzled not remembering any reservations when Kairi tells her that it is about their real jobs and presents them with the mission. 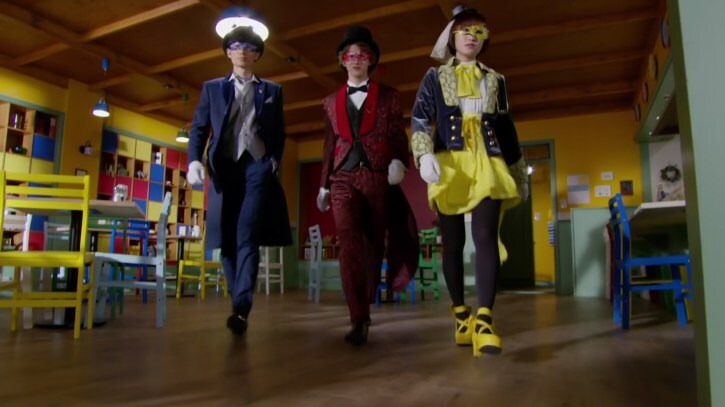 The Lupinrangers get dress in their masquerade Phantom Thieves costumes. 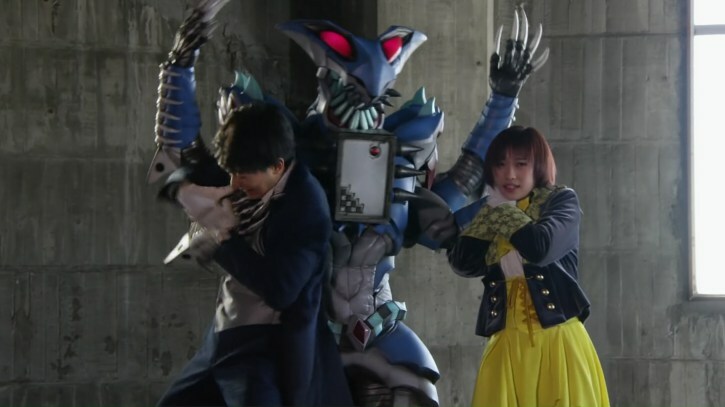 They stealthy arrive at the Garatto Nago's hideout where they attempt to sneak attack but when Umika sees a spider she nearly screams which leads to Kairi trying to hold her mouth to silence her which makes noise and lets Garatto Nago know where they are and shoots the vent out. The skirmish sounds an alert at the G.S.P.O. HQ where Jim Carter tells the team there are reports of the Gangler causing trouble down at the Kurehama Pier. They begin to head out when Commissioner Hilltop stops them and tells them that the "new toys" they were waiting for just arrived as he opens up the two big boxes which has the officers eyes wide in amazement. 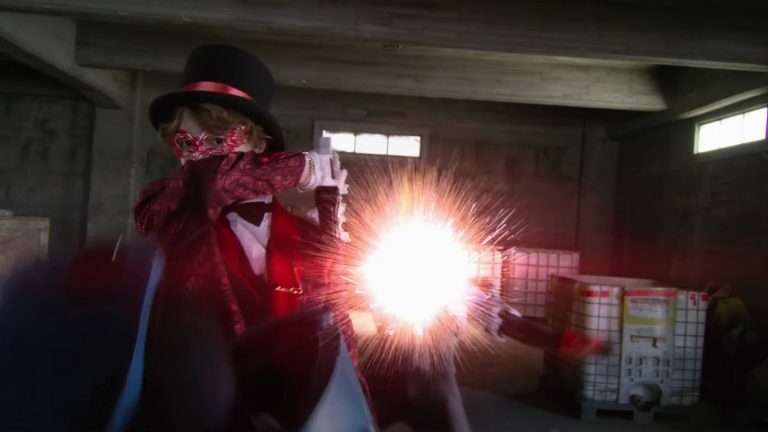 Back at the Kurehama Pier the Lupinrangers still in their Phantom Thieves costumes take on Garatto Nago and his Porderman, but he captures Touma and Umika knocking off their masks and threatens to kill all three of them. With the two others in jeopardy Gairi remembers when they first got together and a promise they made. 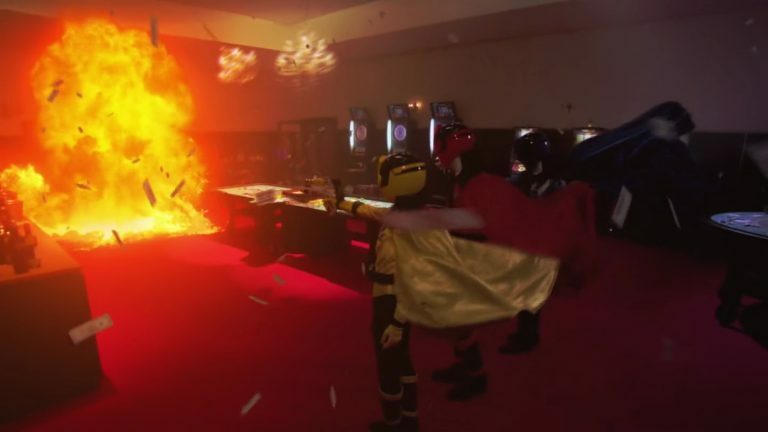 Kairi takes off his mask and shoots the ceiling out so it collapses on Garatto Nago who lets the other two go and it appears that they were buried in the rubble along with Garatto Nago. Kairi lets him know that they made a promise to each other that no matter who falls the others make the dream come true and we see that they survived in a last minute escape. 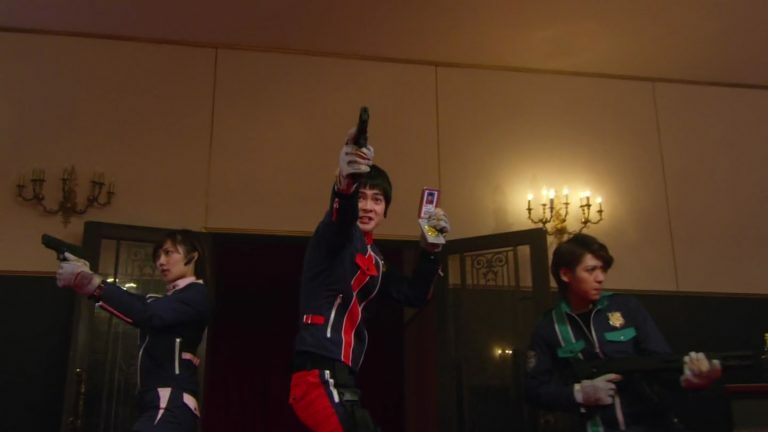 The Lupinranger activate their hensin devices the VS Changers and transform into the Kaitou Sentai Lupinranger. The three take the fight outside with Garatto Nago. They have him against the ropes and about to break into his safe when the G.S.P.O. arrive. 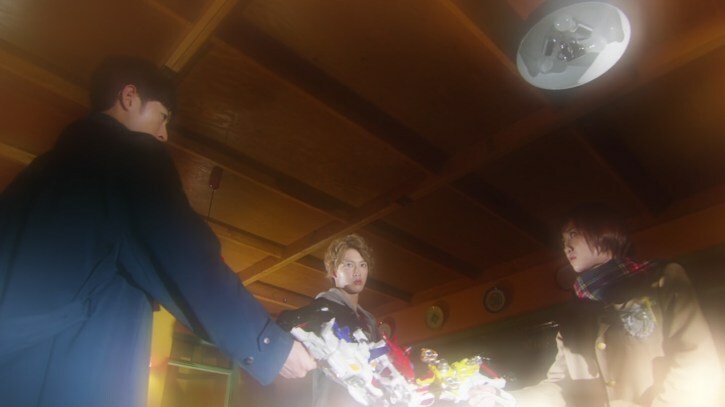 They come between the two when the Lupinrangers see that they have VS Changers as well and wonder how they got pieces of the Lupin Collection. 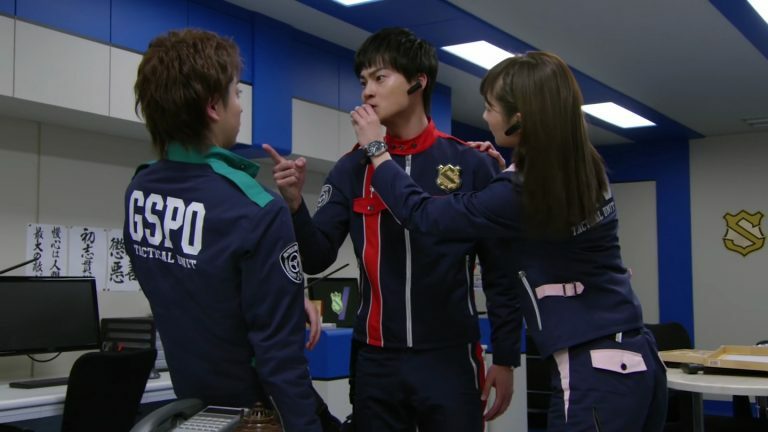 The officers ignore their inquiry presenting their badges telling the Lupinrangers and Garatto Nago are all under arrest. 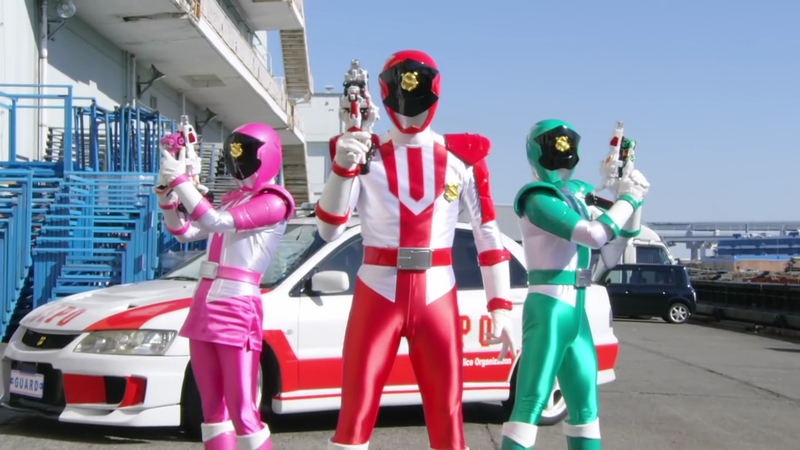 The officers us their VS Changers to henshin and become the Keisatsu Sentai Patrangers. This is the first episode of the new season and it started with a bang!. Right away from the beginning we see what this show is all about. 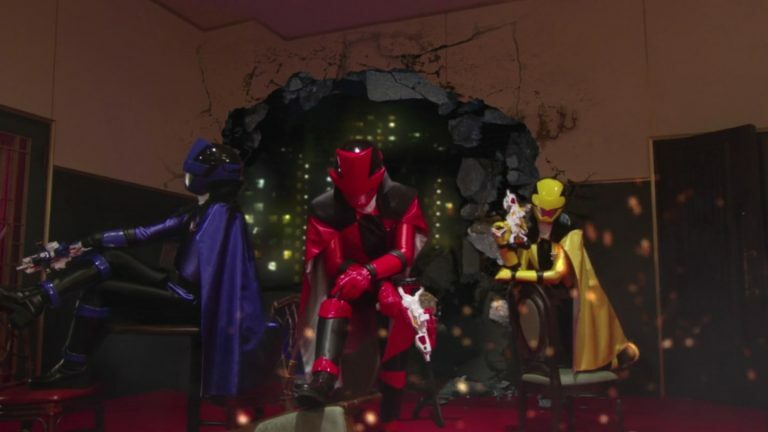 We have the Lupinrangers known as the Phantom Thieves who are after mysterious items that are known as the Lupin Collection that were stolen by the Gangler a group of other-dimensional gangster aliens. Then we have the Patrangers who are cops after the Phantom Thieves/Lupinrangers and the Gangler as to them they are all breaking the law. The costumes look awesome. We have the Lupinrangers in their masquerade like costumes when they are the Phantom Thieves reminding me of Tuxedo Mask. 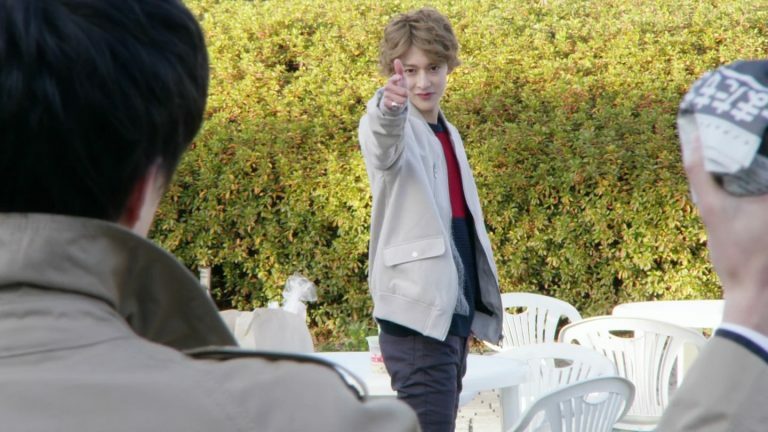 This look is also used for their Lupinranger costumes and even during their hensin. 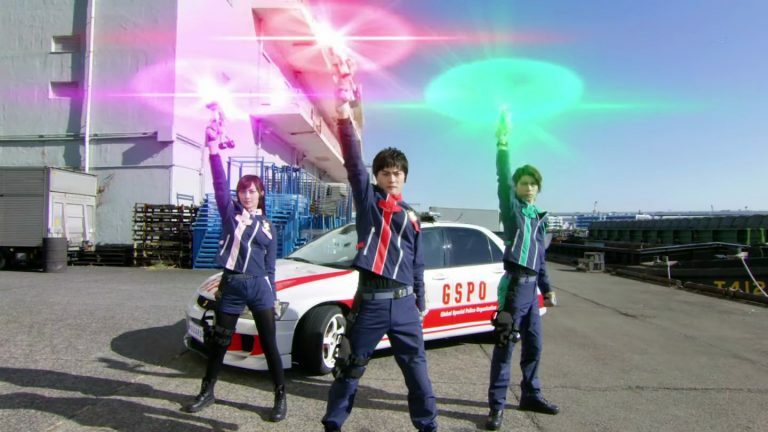 The we have the Patranger whose G.S.P.O. 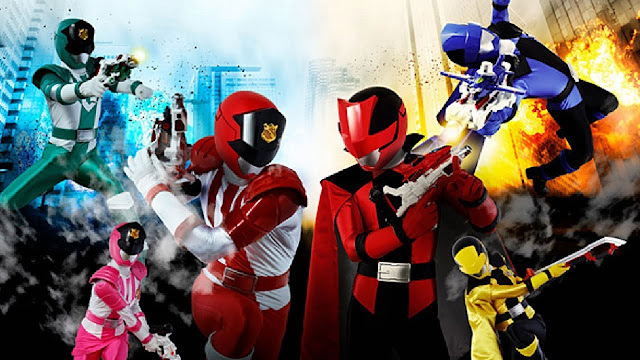 whose uniforms remind me of Dekarangers and Operation Overdrive. 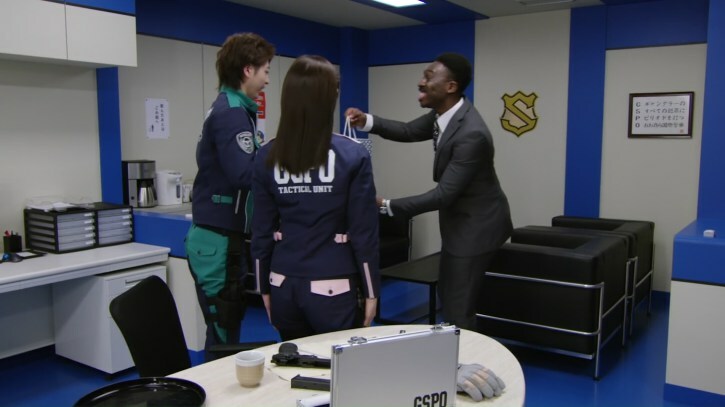 Their Patranger costumes look like police uniforms with a tie and all which is also shown in their henshin. 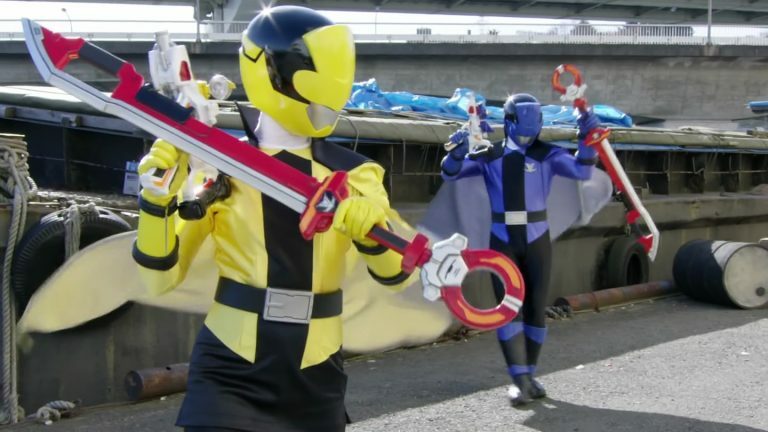 I really like how the two teams mirror the other with the Lupinrangers having black as their secondary color and Patrangers having white, and the black/white spaces on their torsos are reversed with Lupinrangers having their color on the side with a black center and the Patranger having white on the sides with their colors in the center. They almost look like they will fit together like one uniformed look divided by two. I love the supporting characters too. Kogure has a nice air of mystery about him as does his yet unseen employer. Then we have the Patrangers, Commissioner Hilltop seems like he can bring some fun and diversity to the show, while Jim Carter will be his straight man in a fun duo. Given his look, I can see Jim Carter being able to transform into a police cycle and getting into the field at some time also. The Ganglers are essentially mobsters, they have a nice look to them incorporating a safe into their design is a unique idea. Dogranio Yabun the "Godfather" is known as the boss and something tells me his little deal isn't what it seems. He has two what appears to be henchmen a male named Destora Mazzio and a female named Goshu Ru Medu who seems to use her flirting to gain favor with Dogranio Yabun. I hope she doesn't become a one note character but instead is only using that to maybe turn on him and make a big power move. The grunts this year are the Poderman actually speak which can present some interesting moments this season. Overall this was a really solid episode that has me interested in a lot of the characters and the overall story. 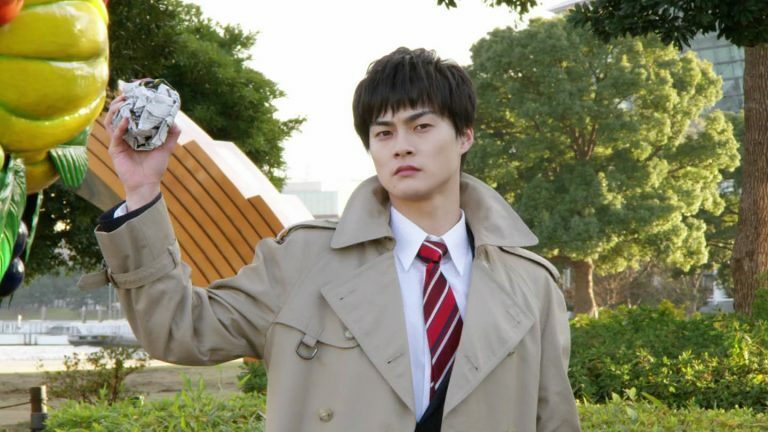 I think I will wind up liking Keiichiro Asaka/Patren 1 Red, he seems to be that by the book hero I am drawn to, while Kairi Yano/Lupin Red seems to be the risk taker. Now these two could really have a dynamic relationship like Sky and Jack in Power Rangers S.P.D. when the two teams eventually join together. Rating: 4 out of 5 Bolts. 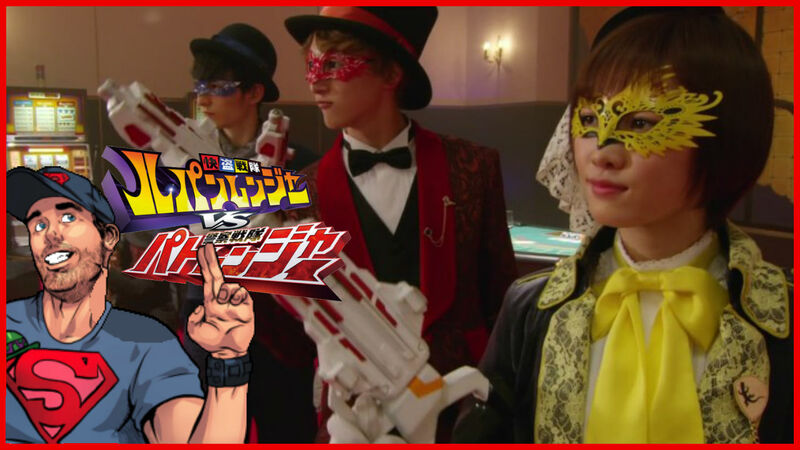 Let us know in the comments what you think of this Kaitou Sentai Lupinranger VS Keisatsu Sentai Patranger Review and don't forget to follow us on Twitter for the latest Previews, Reviews, News and Interviews!